Magento Open Source and Commerce v2.3 include new and expanded features and APIs for Inventory Management. Inventory Management replaces all core APIs in the Open Source CatalogInventory module and the ScalableInventory module in Commerce. It also provides additional APIs to extend and add functionality. Merchants install Inventory Management as a Core Bundled Extension (CBE) with the name magento/inventory-composer-metapackage. It is included in all v2.3 installs and upgrades. Magento Community Contribution – Magento thanks the many contributors to the Multi Source Inventory (MSI) project, developing these features as part of the Magento Community Engineering program. Stocks map a sales channel (currently limited to websites) to source locations and on-hand inventory. A stock can map to multiple sales channels, but a sales channel can be assigned to only one stock. Aggregate Salable Quantity is the total virtual inventory that can be sold through a sales channel. The amount is calculated across all sources assigned to a stock. Reservations track deductions from the salable quantity as customers add products to carts and complete checkout. When an order ships, the reservation clears and deducts the shipped amounts from specific source inventory quantities. In this diagram, a bicycle merchant has inventory for a touring bike in a warehouse and two stores. He has three stocks with configured website sales channels and sources. 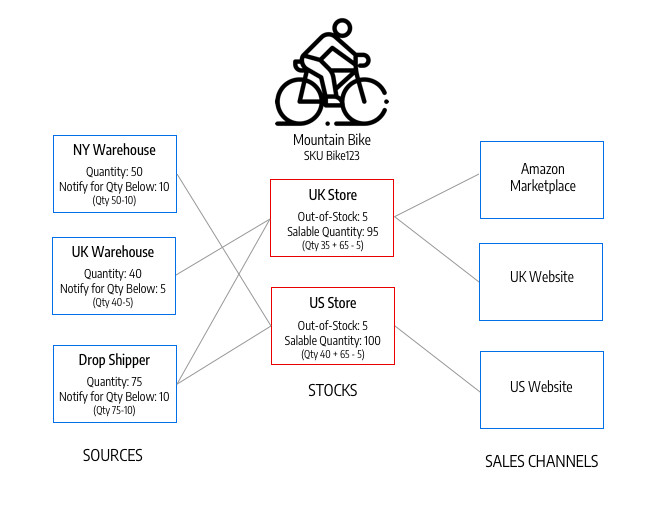 When a customer shops through the UK website, Magento aggregates bike inventory from the warehouse and flagship store sources for a salable quantity of 50. The touring bike can be shipped from either the warehouse or the flagship store, but not the King Street store. The German (DE) web store same stock draws from the same aggregate stock as the UK web store. Source – Defines a physical stock. SourceItem – A relation object that represents the amount of a specific product at a physical source. We use this entity for updating inventory on each source. Quantities might change as a result of synchronizing with an external Product Information Management (PIM) or Enterprise Resource Planning (ERP) system, or internally as a stock deduction during the checkout process. A SourceItem cannot be used for retrieving data that must be rendered on front-end, because only aggregated data should be used for all validations and UI representation. StockItem – Also known as Aggregated Virtual Stock. This is read-only data that the re-indexation process generates. Based on a pre-defined mapping, we define what sources are assigned to the current scope (sales channel) and aggregate quantities from all assigned sources. We also use StockItem to check if a product is in or out of stock. Making this segregation by Read-Only interface (StockItem) and Write-Only interface (SourceItem), the Inventory architecture achieves Command Query Responsibility Segregation (CQRS). As a result, all GET HTTP requests should use StockItem entity, and all POST/PUT should use SourceItem. When merchants are ready to make a partial or full shipment, they select the source or sources from which to send the products. Customers typically want low-cost shipping and a guarantee of safe arrival of products, while the merchant needs to ensure minimal overhead for the inventory storage and shipping costs. Inventory Management includes an algorithm that takes these considerations into account and recommends the best shipping option or options. Magento provides an algorithm for Priority, using the source priority per stock, where each source is given a priority in the scope of a specific sales channel. Inventory Management also supports developer-provided extensions for other algorithms based on criteria such as cheapest shipping and closest GPS location. Order Processing with Inventory Management is a tutorial that uses REST calls to illustrate the life cycle of an order in an Multi Source Inventory environment. Manage sources is the starting point for REST reference documentation.